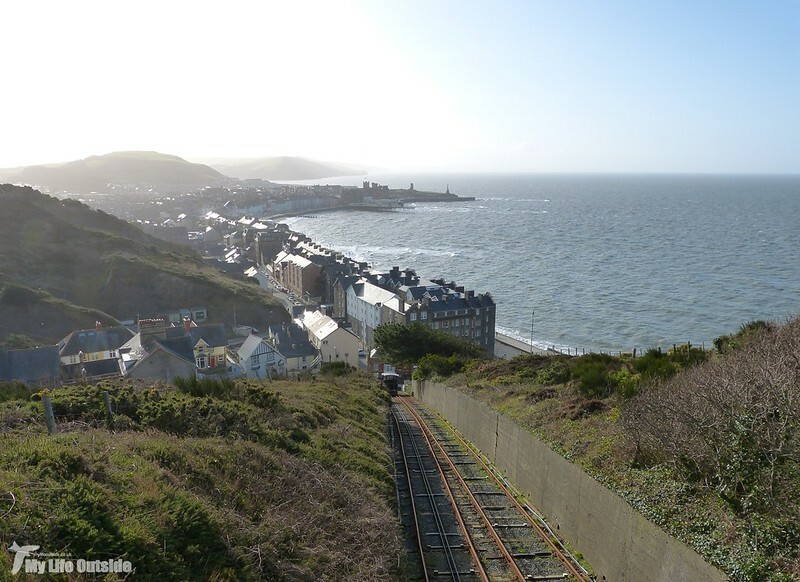 Whenever I happen to mention that we've just spent a day in Aberystwyth, the response received is almost universally one of puzzlement. Why bother travelling into the depths of mid-Wales they ask? My answer is always simple. A stunning coastline, one of the countries best preserved seaside towns and of course my home from home after spending five years there at university. Inevitably many others share these views meaning that to avoid the crowds we tend to take our trips out of season, the most recent being just last Saturday. All the forecasts promised a fine day but upon our arrival there was still a bank of cloud present and with it an absolutely freezing wind blasting in from the sea. 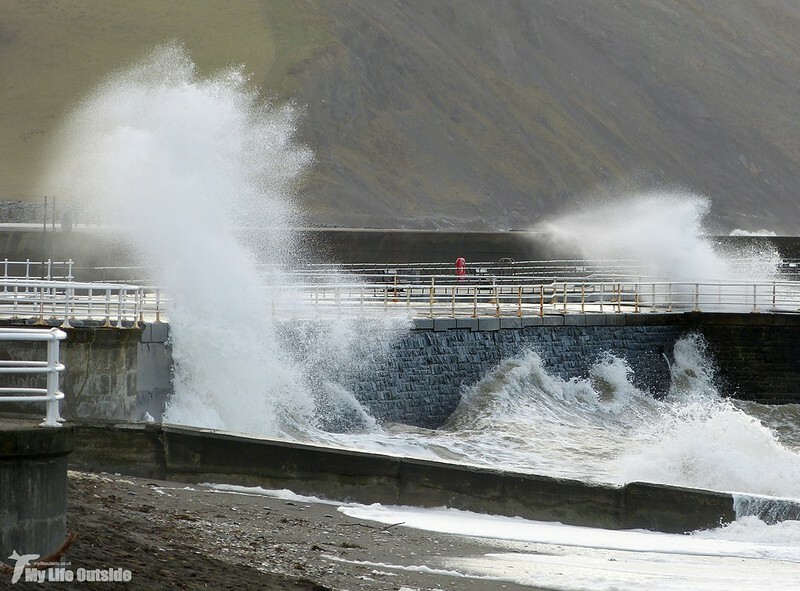 Combined with a high tide these conditions were perfect for a little wave over wall action, an occurrence which seems to be developing into a fairly regular event. 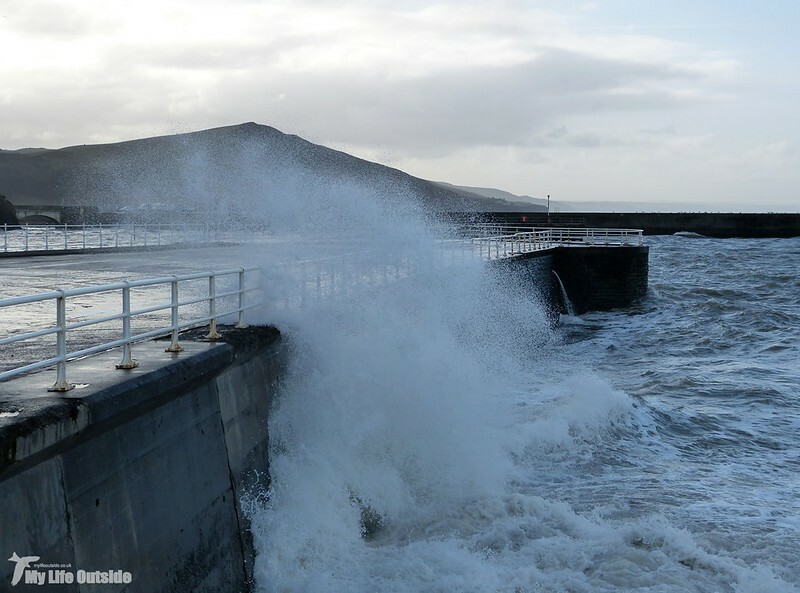 Despite the choppy sea conditions were incredibly clear allowing excellent visibility out across Cardigan Bay. I had hoped for a diver species or two but was left more than satisfied with a couple of Dolphins (species unknown) passing to the south. Unfortunately I couldn't get Emma onto them in time but what a way to start the day. By the time we'd made our way along south beach any sign of the early morning cloud had been banished inland allowing the warming sun to finally break through. With the tide still high we checked for Purple Sandpipers roosting on the sea wall and quickly found three birds which quickly turned into five and then six as each group took flight. The stones which make up the sheer defences here provide ideal perches for these charismatic little waders but on a day like today care had to be taken by all involved not to get a significant soaking. I can only imagine what I must have looked like hanging over the barriers but I think the results speak for themselves. 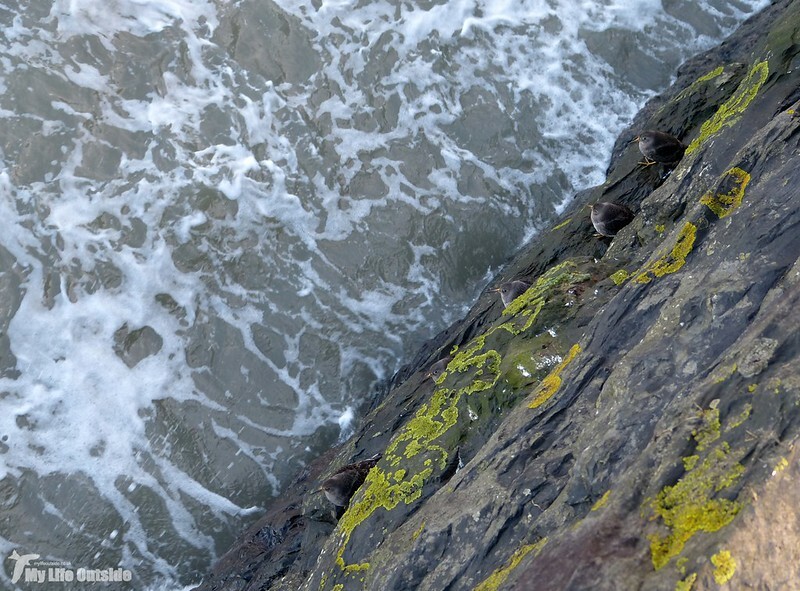 There's not many other places you can get this close to Purple Sandpipers. 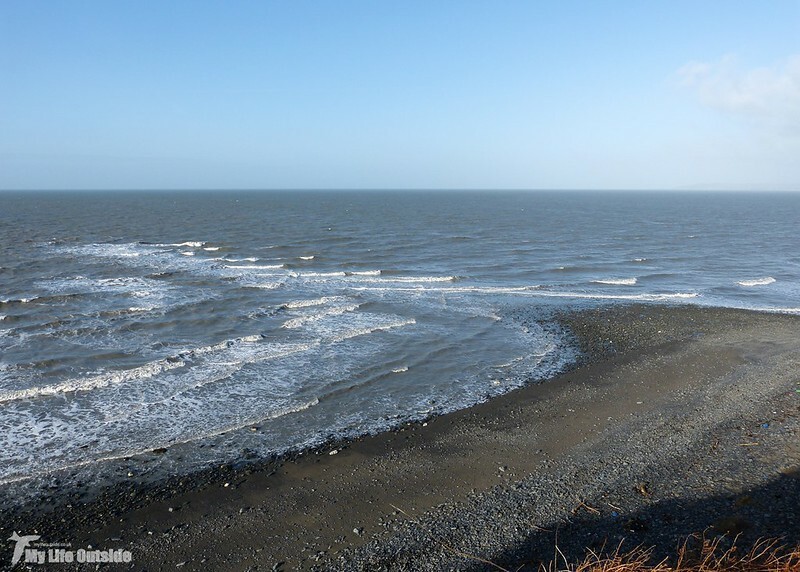 Waves, Dolphins and Purple Sandpipers however were just the prelude as our main reason for being here was to walk the coast path from Aberystwyth to Wallog. This route holds special significance for both of us as walking it formed our first 'date' over nine years ago now and is also the location where Geoffrey first gained his name (our pet name for Oystercatchers - don't ask). 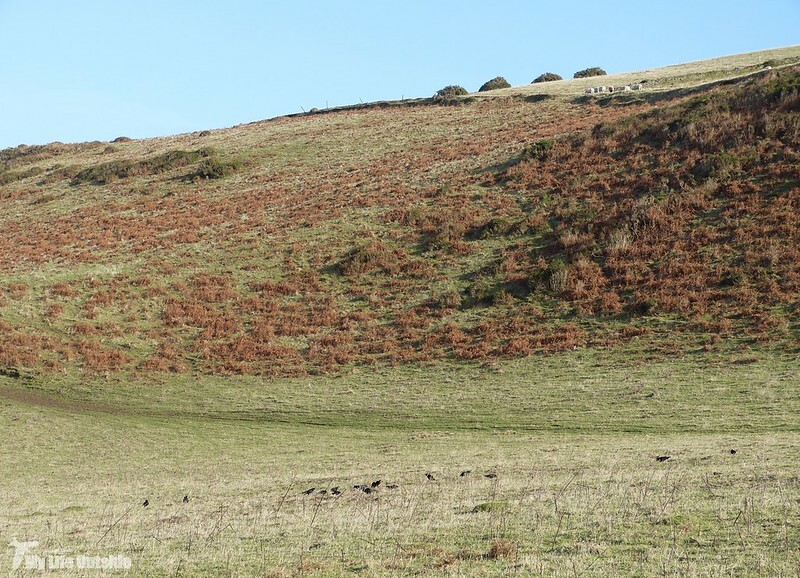 Standing between us and Wallog however is Constitution Hill, a steep climb which offers stunning views back across town. At the top sits the worlds largest camera obscura as well as a cafe and Frisbee golf course. Let me assure you however that going on past experience the latter should not be attempted on a windy day. Pushing on the gentle route winds along cliff tops before dropping back down to sea level at Clarach Bay. 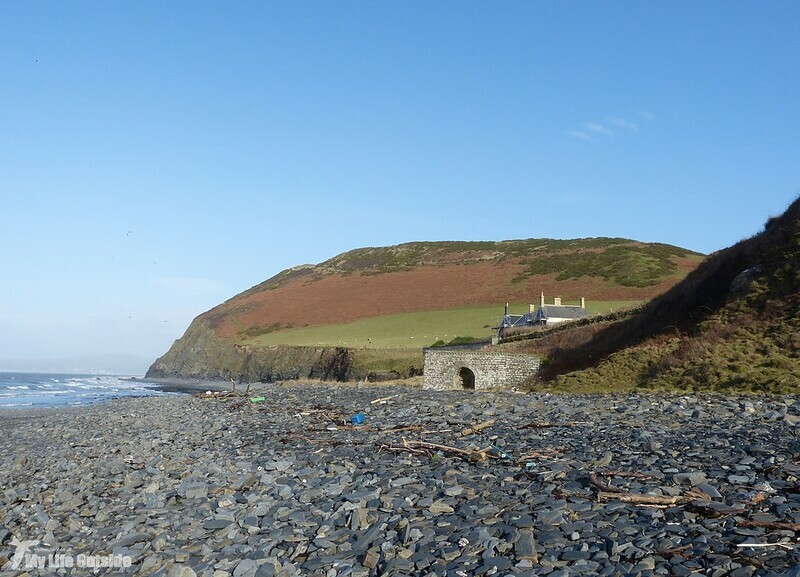 Now if Aberystwyth stands as a shining example of how seaside development should be done then Clarach sits firmly at the opposite end of the scale. Static caravans, ugly buildings and a few run-down rides combine with the desolation of winter to create a curious blot in an otherwise beautiful landscape. 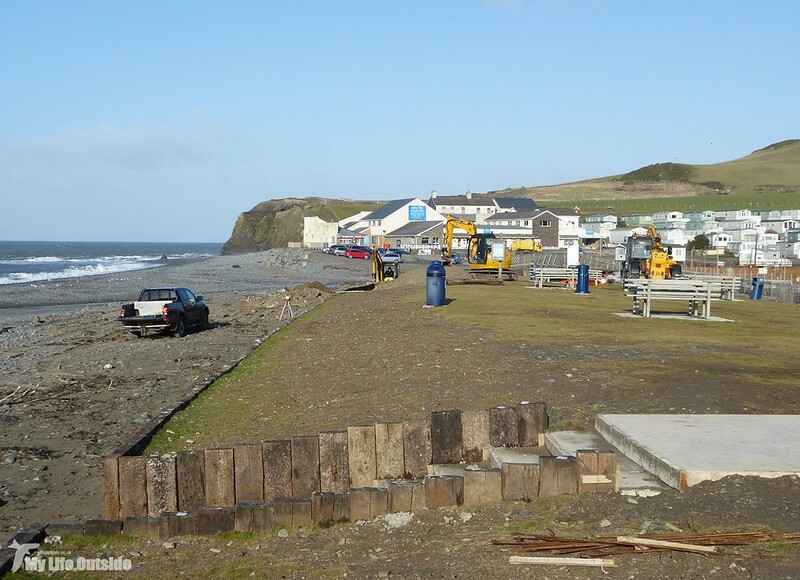 Down in Clarach itself it was clear that repairs were still being undertaken following last winters storm surge. New wooden sleepers were being lined up along the low earthen bank which serves as the only sea defences here, a structure which surely must be under increasing threat as our ocean levels continue to rise. Clarach is not without its appeals however with a decent Oystercatcher roost and at least two Common Gulls at the river mouth. 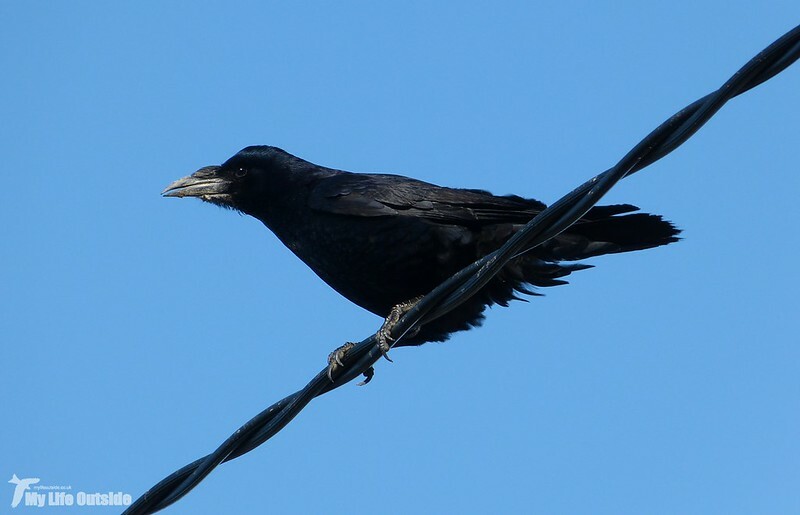 Best of all perhaps was this Carrion Crow which was belting out the strangest combination of calls I've ever heard. I really should have recorded it but alas the moment was gone before the thought had occurred to me. Leaving Clarach behind it doesn't take long before you're back out amongst unspoilt countryside with extensive views in all directions. A trio of Buzzards kept watch over our landward side whilst out at sea a couple of passing Guillemots were about as exciting as it got. What we really wanted to see however were some Chough, a wish granted in spectacular fashion when we stumbled across a remarkable flock of fifteen individuals. This is by far the biggest gathering of Chough I've yet witnessed and represents a quite incredible success story for a species which was once almost extinct from these shores. Another passing group of walkers seemed to unsettle the flock and put them into the air but they soon returned and were a constant presence for the rest of the day. Even when at Wallog part of what I presume to be the same group could be seen flying back and forth, a destination reached not long after our original sighting. From the elevated cliff path its mansion and lime kiln are instantly recognisable and if I'm not very much mistaken were used in the recent Christmas special of Hnterland. 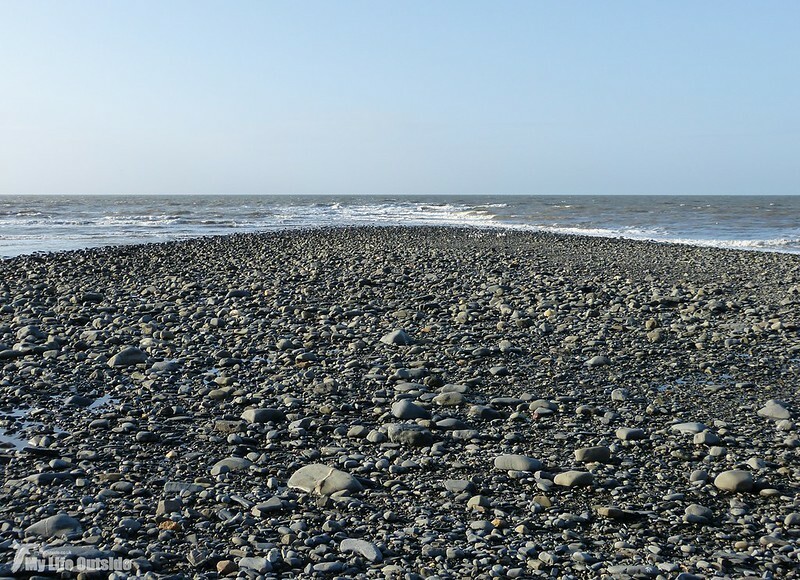 The most well know feature at Wallog however is a shingle spit which goes by the name of Sarn Gynfelyn. Believed to be a long sub-tidal bank of glacial moraine it stretches for about eleven kilometres out into the Atlantic. It's only really at low tide however that Sarn Gynfelyn is truly revealed at which point it very much resembles a man-made causeway. Undoubtedly this similarity led to the centuries-old legend that it was once one of the routes to a long lost land called Cantre'r Gwaelod. I can't personally vouch for the accuracy of that tale but who knows in a landscape as ancient as this. Down on the beach a flock of ten or so Common Gulls was another nice find along with a decent sized group of Guillemots feeding off the end of Sarn Gynfelyn. A strongly marked Meadow Pipit briefly got the pulses racing but alas we failed to turn it into anything more unusual before it was time to retrace our steps back to Aberystwyth. We arrived with about forty minutes left until sunset, just enough time to get into position for an evening spectacle which thanks to the likes of Springwatch has now become a well known phenomenon. The gathered crowds no doubt annoyed those landscape photographers who were hoping to capture the sunset but our eyes were turned skywards waiting for the first arrivals. Was our wait a fruitful one? You'll have to wait until Thursday to find out. Fantastic photos. I love the pretty Purple Sandpiper! And the Crow is cool. Beautiful scenic views.. Have a happy week ahead! 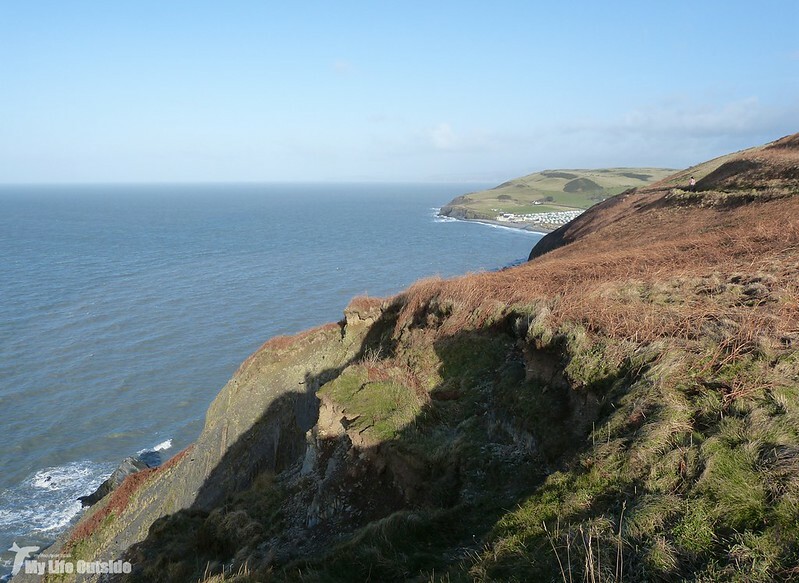 Such fantastic views and unusual landscapes. 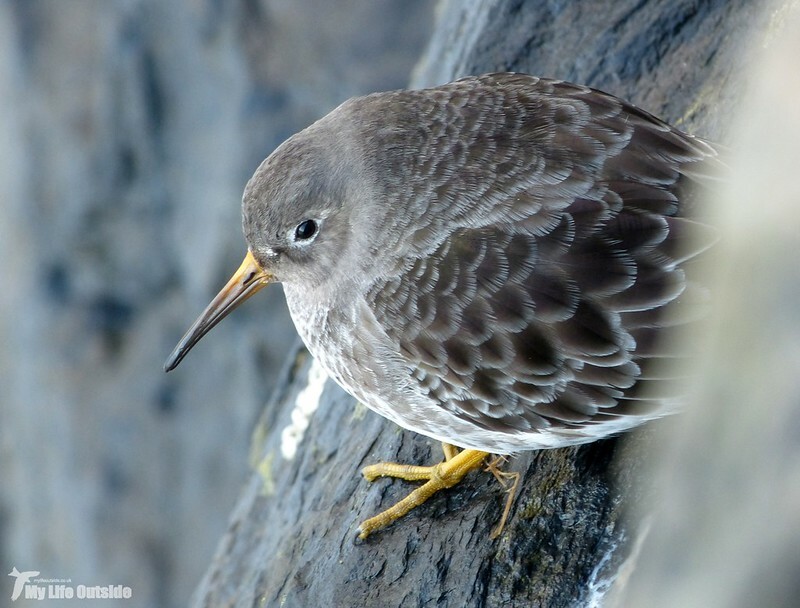 The Purple Sandpiper is a beauty. They certainly are. Probably my favourite wader after Turnstones. What a great walk. Have you any shots from inside the Camera Obscura? I haven't unfortunately Adrian as it's closed during the winter. Perfect excuse for a return visit though. Fabulous images.I love the waves crashing on the pier and the way the Purple Sandpipers are peeping out. Thanks Margaret. Don't think I could live away from the sea now as the coast is just too damn dynamic. I would say any place in Wales would be a beautiful spot to be! Loved the breakers in the first shots! And oh that purple sandpiper! fantastic captures (though I am a little worried about your safety!) Loved the rocky beachline and all your photos were just wonderful! Completely agree with you there Marie. And don't worry about me. I'm a seasoned pro at hanging off walls. Fantastic scenery, and the Purple Sandpipers, they are superb Adam. 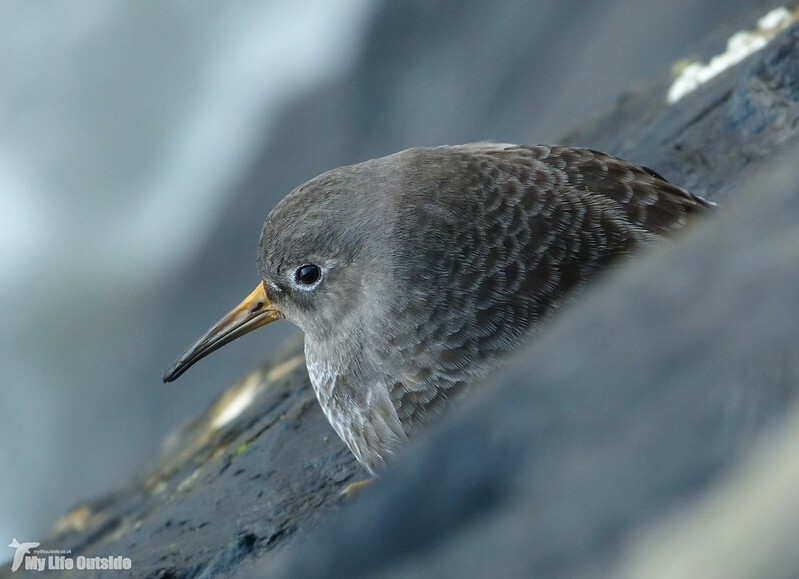 Lovely shots of the Purple Sandpipers! :) In the second capture you can really see all the detail in the plumagem. Great shot of the Crow, and the bay taken from Constitution Hill is stunning. I'm always impressed at the detail to be found on a bird's plumage up close and those Purple Sandpipers could not have posed any better. 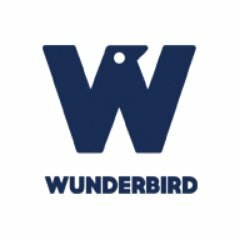 15 Chough? Wow! That would be a highlight - don't think I've seen that many combined! Certainly was Stewart. 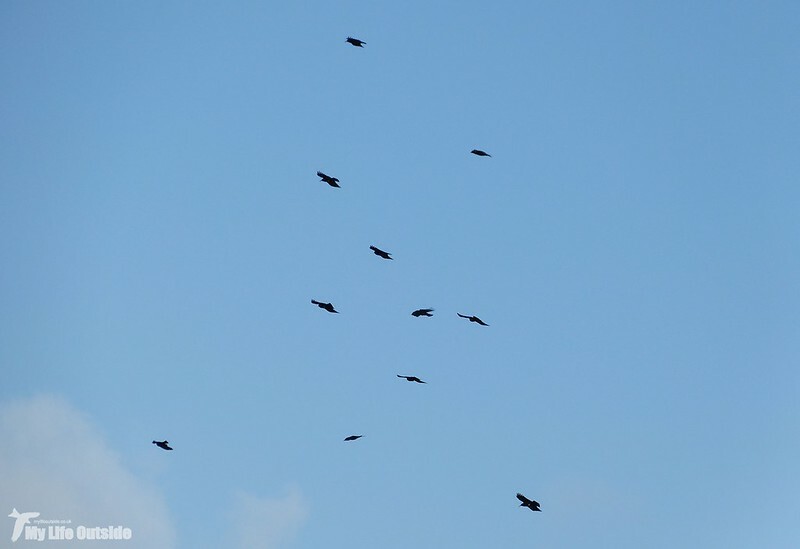 Choughs seem to be going from strength to strength. 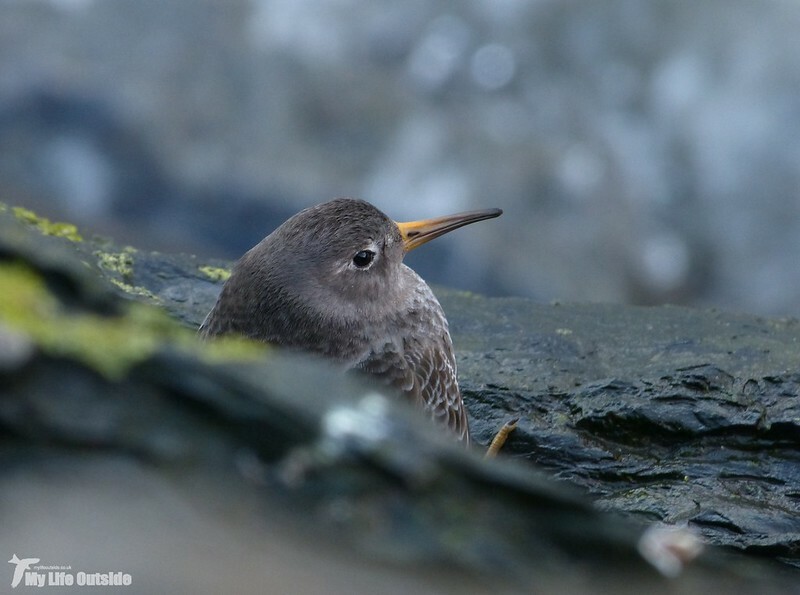 Great post and fantastic bird, Purple Sandpiper beautiful bird!